The Parker Semi-Upholstered Glider and Nursing Ottoman is the perfect choice for those late night feedings and the smooth gliding motion will help you soothe your baby to sleep. The accompanying ottoman features a pull-out nursing stool that allows you to comfortably rest your feet during feeding time. When not in use, the nursing stool folds under the ottoman for safe storage and added versatility. With its classic bow back shape, luxurious upholstered arms and unparalleled comfort, you will appreciate this Graco Parker Semi-Upholstered Glider and Nursing Ottomanfor years to come. This practical changing table goes really well with the look you've always wanted for your little sweetie's room. We designed it for moms-to-be who would like soothing pastel tones in a nice calm setting, or a lot of colour with a touch of fantasy. Turn it into a double dresser once your child grows up by removing the changing station! We love the simplicity of this collection, which will go nicely with your nursery decor, whether you have a girl or boy -you just need to vary the wall and accessory colors. This changing table appeals to moms with trendy or more eclectic tastes. his item comes with a 5- year quality guarantee. Can be combined with items of this collection. This practical Pure White Tender Dreams changing table offers total safety thanks to its rounded contours and front panel. It also has an open storage compartment ideal for keeping your essentials close at hand. Features 2 drawers fitted with attractive wood handles and an open storage. Its top is not removable and it has been designed to support a child of up to 35 pounds. The interior drawer dimensions are 29-3/4-inch wide by 14-1/4-inch front to back. Plastic slides featuring stops and built-in dampers. The open storage space measure 31-3/4-inch wide by 18-1/4-inch deep by 8-1/4-inch high. It is manufactured in compliance with consumer health and safety laws and ASTM standard F2057. Parker Glider/Ottoman - Cherry/Beige The Parker Semi-Upholstered Glider and Nursing Ottoman is the perfect choice for those late night feedings and the smooth gliding motion will help you soothe your baby to sleep. The accompanying ottoman features a pull-out nursing stool that allows you to comfortably rest your feet during feeding time. 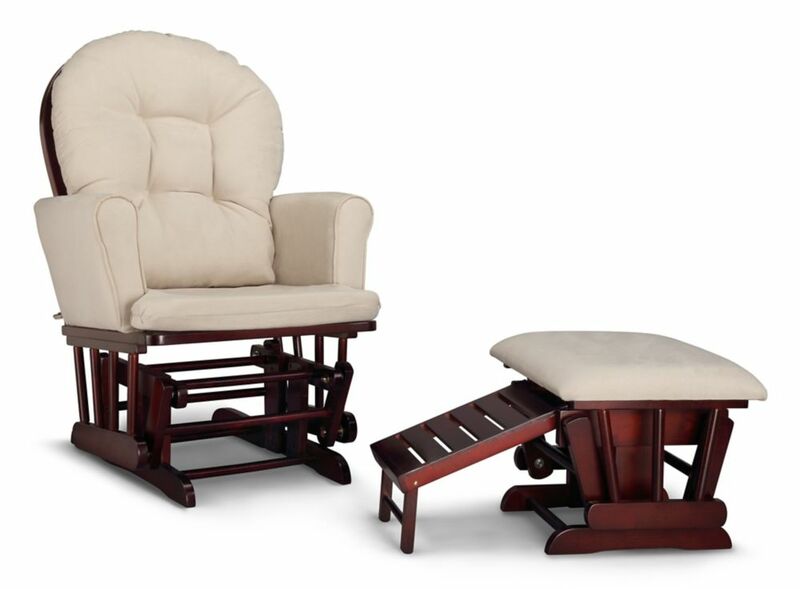 When not in use, the nursing stool folds under the ottoman for safe storage and added versatility. With its classic bow back shape, luxurious upholstered arms and unparalleled comfort, you will appreciate this Graco Parker Semi-Upholstered Glider and Nursing Ottomanfor years to come.